The Fourth Industrial Revolution has been a crucible from which has emerged a whole range of technologies granting ever greater convenience and personalisation for consumers. Unsurprisingly, consumer behaviour and demands have changed swiftly and irrevocably in response. Businesses are rightly nervous that if they do not keep pace they risk finding themselves left behind by more agile and disruptive competitors -they’ve seen entire industries, taxis and music spring to mind, up-ended. And when the dust has settled, it has been the disruptors occupying the market-leading positions previously enjoyed by established players. The property space, in which we operate, is seeing disruption too. Airbnb has caused building managers to rethink the way they let their properties, and hotels the value proposition they offer. WeWork has forced a major shift in approach, not just in how landlords provide flexible office space, but increasingly in the way large corporates think about the atmospheres and amenities they provide to their staff. Artificial Intelligence and online marketplaces threaten to replace property agents. In fact for many if not most industries, disruption or the threat of disruption is a constant. The story of Kodak is a case study in what not to do in response. Kodak was once an aristocrat of the business world, synonymous with photography, global in scale and ambition. No teenager today has heard of it and the company filed for bankruptcy protection in 2012. Kodak was selling photographic film and prints to a world which consumed photographs in an entirely different, digital, way. 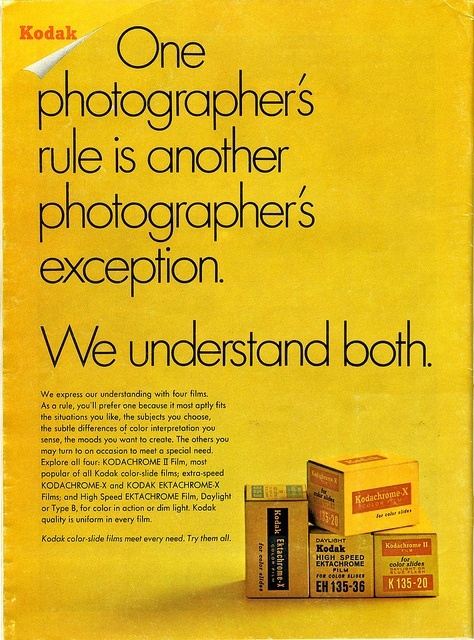 What is most surprising about Kodak’s demise was that they had been ahead of the trend to digital. Ironically, the company invented the first digital camera in 1975; thus starting the very category that would in time make the company redundant. In 1981, it commissioned an internal report correctly predicting that digital photography would start replacing film based photography in ten years. But in that decade, and the succeeding two, it unforgivably failed to act on that insight. Kodak did invest significantly in digital technology, spending over $500m on developing and launching the Advantix Preview film and camera system in the mid-eighties. The Advantix system allowed users to preview their shots as digital cameras do today. But it had a major disadvantage – it still used film. Kodak were trying to artificially harness a new trend to their legacy business. Not surprisingly, the awkward Advantix was a flop, and resulted in Kodak writing off almost the entire cost of development. The company understood that photos would eventually be shared online with heavy investment into the digital camera. What it failed to realise was that the sharing platforms would themselves become the real source of value, rather than being an adjunct to printed photographs. By ignoring the mounting evidence that this was the case, Kodak signed its own death warrant. Companies which interpret new trends solely through the prism of their existing business are running a huge risk, though it may not feel like it at the time. Truly valuable companies tend to look very different to their historic incarnations – take Microsoft, where Windows provided under one quarter of revenue in FY 2018 vs. close to 100% a decade ago. To truly stay ahead of the disruptors a businesses must fearlessly embrace and understand the impact of change. Disruption and change are definitely opportunities, rather than threats. For those companies who recognise the power that disruption has to revolutionise markets and transform business models will ultimately come out on top. While Kodak stagnated in their “Kodak moment”, the disruptors ran fearlessly forward, arms and minds wide-open. There are a few ways in which we can measure the success of industry disruptors and perhaps get ahead. For a start, disruptors grasp the importance of digital transformation. We must understand that adapting a business operation is far more crucial to digital transformative success than simply adopting new technologies into it. Afterall, the technology driving a business will change year upon year, which is why it’s vital that technologies are implemented correctly from the inside out.